Browse, borrow, and enjoy over twenty thousand digital titles from the Maryland's Digital eLibrary Consortium collection. To gain 24/7 access, all you need is a Maryland library card. Or click here for more information on Libby, the Maryland's Digital eLibrary app, that lets you borrow thousands of ebooks and audiobooks instantly, for free, using just the mobile device in your hand. Don't have a Maryland library card? Come to the Yarnall Library circulation desk to sign up with the Montgomery County Public Library. The votes have been counted and almost 81,000 students from across the state have selected their favorite books as part the Maryland Black-Eyed Susan Book Award program. To see the complete list of the 2017-2018 book award nominees, visit this page of the Prince George's County Library website. 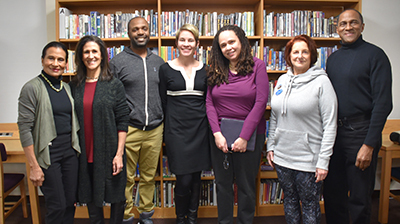 On Wednesday, January 31, the Yarnall Library hosted an evening of conversation with community members as they shared their experiences of interracial marriage in the DC area. The panel discussion was moderated by NPR's Korva Coleman, and featured couples from Sandy Spring, including Chandlee Offerman; anti-miscegenation laws made it illegal for Chandlee and her husband Andy to marry in 1960s Maryland. All together the panel's experience of "mixed" marriage spanned the 50 years since the United States Supreme Court struck down anti-miscegenation laws across the country. Oct. 2, 2017: Author Patricia Hruby Powell was on campus working with US Dance and English classes and presenting both US and MS assemblies on the creative and research processes behind her books. She shared her personal experiences, her inner wonderings, and the systems she set up to keep track of research materials she gathered. Patricia had a wonderful experience with our students and campus. 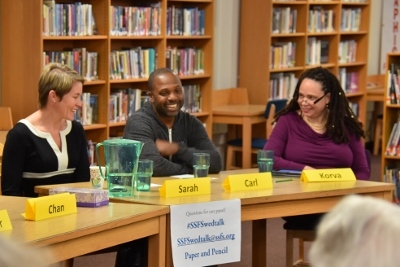 Sept. 22, 2017: Husband and wife author-illustrator team Sean Qualls and Selina Alko, creators of our LS community read, A Case for Loving spent time at SSFS with the preschool classes, the 4th and 5th graders, MS English students, and presented at a Lower School assembly. They lunched with members of the MS book club, and all day long generously shared about their writing and art and listened to (and were very impressed by) our students. Author Kate Hannigan joined us for a terrific day on April 5th. 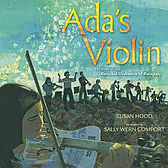 She engaged 4th, 5th and 6th graders with her stories and thoughts about reading, writing, research and resilience. She also shared her "scroll of doom" a 65 foot compilation of the many rejection letters she got on the way to becoming a successful author. March 2 was Dr. Seuss's birthday and we celebrated with seussian fun - some of our favorite Seuss books and a chance to get into the character of that pesky Cat in the Hat. Flipster: Read 16 of our magazines subscriptions on any computer or device! To read offline, install the EBSCO Flipster magazine reader app, and follow the directions.